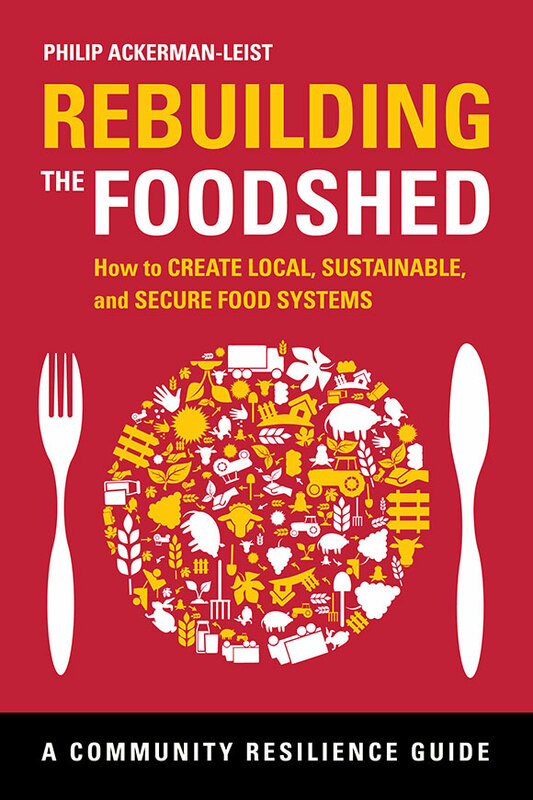 THERE's a lot in Philip Ackerman-Leist's book, Rebuilding the Foodshed, but don't expect to come away from reading it with a formula to go and create a viable local food system. 'Foodshed' is a name for a food-producing region that feeds a city. It's sometimes called an 'urban food bowl' and can be likened to the watershed or catchment that supplies an urban region's water supply. Ackerman-Leist's book is a good discussion about local or, as I and others call them, 'regional' food systems, and the author cites numerous US examples. My preference for 'regional' rather than 'local' as a geographically descriptive term for food systems comes from the experience of the Brisbane and Sydney community supported agriculture (CSA) social enterprises, both of which were known as Food Connect (in early 2014, Sydney Food Connect was absorbed into another CSA, Ooooby). These sourced foods from farms up to five or so hours drive from their respective cities. They did this because that distance gave access to the different climatic conditions, altitudes, soils and growing conditions that produce a sufficient range of foods to make up a nutritionally sound diet. Sourcing a nutritionally fuller range of foods closer to home might be possible in agriculturally and climatically blessed regions, however those are not all that widespread. This is why ideas like living off a 100 mile diet, an interesting experiment that appears in a number of books, is often impractical for city people. The other reason I prefer to talk about regional rather than local food (while acknowledging that for many people the terms imply the same thing) is that the agricultural produce of a defined geographical region, what some would call a 'bioregion', though that's a term heard less of these days, may have certain distinct qualities upon which a range of characteristic food products can be developed that can form the basis of a regional food economy. Think of geographically definable food regions of, say, Italy, and how they are the basis of a food culture that can be, and I hate to use this word because it simplifies things, marketable. First, a digression into the idea of 'food miles'. The quaintly unmetricised term is an estimate of the distance food is transported. It accounts for maybe around ten percent of energy embodied in the food supply chain and, by itself, is no measure of food system sustainability. That has to include farming methods and their environmental, energy and water costs as well as materials — including food packaging and its production and disposal after use. Then there's what happens to agricultural and food wastes on the farm, in the processing facility and in the home and restaurant. The first serious exploration of food miles in Australia came out of the Melbourne sustainability education centre, CERES, close to a decade ago. But the idea has caught on, sometimes at the expense of understanding food system sustainability, and when we do the food topic in the sustainable living courses my partner runs for her local council, food miles keeps coming up. It's an idea that has lodged in people's minds at the expense of a real appreciation of the factors making up true food system sustainability. Ackerman-Leist rightly warns about too tight a definition of local foods, pointing out that the dominant focus on 'food miles' obscures energy sinks in food production, processing and storage. Rebuilding the Foodshed is about a lot more than food miles. Ackerman-Leist's ideas are very much about food as a system and in the book he writes about how systems thinking will take us a lot further than ideology when it comes to viable local food systems. For example, he talks of local food systems versions 1.0 and 2.0, the latter including an interactive community conversation about food, not just the marketplace pitch about local food which is local food version 1.0. He writes of how we need to move beyond marketing to marketplace transformation, beyond 'buying to buy-in'. He talks of the transformation of ideas, investment and infrastructure. It's this deeper approach to building local or regional food systems, whatever your chosen descriptor, that marks this book. My take on what Ackerman-Leist is saying is this: let's go beyond a focus on the food itself, such as you find with consumption oriented foodie-gourmets and in the restaurant industry with celebrity chefs, valuable though their contribution can sometimes be. Instead of this surface appreciation of local food, let's set up those things that make that local food a viable proposition, writes Ackerman-Leist. That's about infrastructure — government policy, economics, markets and building a popular culture around local food. This goes beyond portraying farmers in some idyllic, hero sense and looking more at the constraints and opportunities that affect their capacity to produce for a local food system. Ackerman-Leist discusses at length a whole range of good ideas, such as generating biogas — methane — from food wastes in the city, and he talks about a mobile flash-freeze unit that travels to farms to process on site. He discusses food policy councils, citing US examples, and suggests they be composed of farmers, advocates, food educators and others and that they take a proactive role of identifying challenges and proposing innovations. and commercial with its market gardens, orchards and poultry farms. Ackerman-Leist says that conserving land for agricultural production in the cities themselves is as important as is preserving urban fringe land for market gardening and orcharding. Civic agriculture, he writes, is an educational gateway through which the local food system becomes accessible. Ackerman-Leist seems to envision local food systems as networks, though he doesn't say this explicitly, when he speaks of the flows of community, commerce and ecology that links components and talks about avoiding the 'illusory island effect' of isolated local food systems. That would be the result of drawing too tight a boundary around a local food system such as would come from the idea of eating seasonal produce only from the local region, and nothing else. The allusion seems to be to systems dynamics with its stocks of production capacity and knowledge linked by the types of flows he mentions. The internet is to be valued for its disintermediation capability, Ackerman-Leist suggests... its capacity for producers and eaters to bypass middlemen in the food chain and form direct trading links. In practice, this is the business model of community supported agriculture (CSA) schemes where members go to the farm to collect their food boxes, however that's somewhat impractical for people in big cities on account of the distances they have to travel. A better model doesn't displace the middleman, it transforms the role. That's the Food Connect or Ooooby (Out Of Our Own Backyards) model in which the middleman does the aggregator role of collecting together produce from participating farmers and getting it to subscribers while returning a fair price to the farmers, far more than, say, the supermarket system returns. It's the internet that has enabled the expansion of the CSA model. The internet also figures in a new model Ackerman-Leist discusses — direct international sales of foods that cannot be produced in the buyer's region and that there is sufficient demand for, such as tropical produce from Central America in the US's colder northern regions. The idea is that growers or aggregators who combine the production of a region's farms sell to buyers in the US via internet direct selling, then ship the goods. He says this improves the established Fair Trade system. At basics, it's the model that Amazon uses to sell books and just as Amazon sidesteps bookshops, so does this model sidestep other intermediate middlemen and the costs they add to food. Disintermediation, that is. Ackerman-Leist raises the model of local food systems I recall discussing some years ago with Helena Norberg-Hodge, an author and international development worker who wrote Ancient Futures, a book about her work in Ladakh, and who was an early advocate of local food systems. The model was essentially one of import replacement. Foods that could be produced within a region be given policy and economic priority while produce from different climates, stuff that cannot be produced in the region, be imported from elsewhere in the country or internationally. This allows for trade in foods while prioritising local food-based economies. It might not satisfy local food purists but it acknowledges the reality that foods have been internationally traded for a long time and that public demand for certain foods will continue to sustain longer-distance trade. Such a model could be supported by state governments introducing local food acts to establish the legislative basis of the idea, though Ackerman-Leist does not mention these initiatives. There's lots in this book but I came away wishing that Ackerman-Leist had left us with a how-to guide to implementing all those good ideas he discusses. Reading the book was like attending an academic seminar — lots of good discussion but far too little on the how-to side... more an exploration of something than a path to action. I also came away with the thought that a similar book written from an Australian perspective would be a good idea. Here in this country and despite government, which in early 2014 axed the promised Community Food Grants scheme, a local food movement is in its early adopter phase. Given focus, time and opportunity to grab more attention, to engage at the deeper level of food systems Ackerman-Leist talks about, it could then move into a 'taking action' phase. There, institutions could be established to provide the economic and cultural impetus that would allow enabling policy proposals to be developed and advocated effectively. Doing that would, in this country, do what Ackerman-Leist's title suggests — rebuilding the foodshed. Philip Ackerman-Leist, 2013; Rebuilding the Foodshed; Post Carbon Instutue, California. Print and ebook.